Following week-long excavation of a crashed Spitfire in October last year, a permanent memorial to Pilot Officer Harold Penketh, who lost his life in the crash in 1940, has been unveiled in a dedication service near to the crash site at Holme Lode. 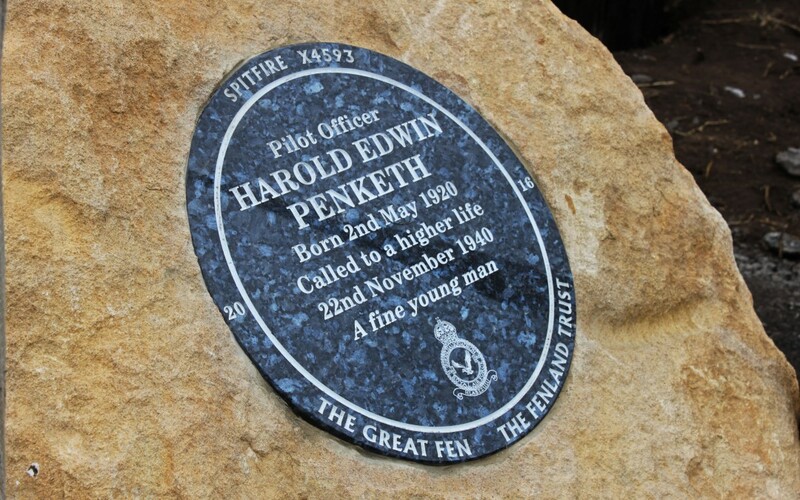 The Wildlife Trust for Bedfordshire, Cambridgeshire and Northamptonshire (BCN) commissioned a plaque set in Clipsham stone, with an information board nearby, detailing the history of the incident and of pilot Harold Penketh. The excavation took place in October 2015, and the memorial stone was unveiled during a short service, attended by those who took part in the dig and led by the Suffragan Bishop of Ely, The Rt. Revd Dr David Thomson FSA, Bishop of Huntingdon. Family relatives made contact with the Wildlife Trust BCN during the excavation week after a family member read about the dig via TV news – previous searches made by the Ministry of Defence had not been able to trace any family – two first cousins of Harold Penketh - Valetta Cranmer (see image left) and Sheila Morris - attended the service. Recovered and restored remains of the plane are now at RAF Wyton Pathfinder Collection, viewing by appointment only.